Mr. and Mrs. Watson's porcine wonder, Mercy, loves nothing more than a ride in the car. It takes a fair amount of nudging and bribing and a "You are such a good sport, darling" to get the portly pig out of the driver's seat, but once the convertible is on the road, Mercy loves the feel of the wind tickling her ears and the sun on her snout. One day the Watsons' motoring ritual takes an unexpected turn, however, when their elderly neighbor Baby Lincoln pops up in the backseat in hopes of some "folly and adventure" – and in the chaos that ensues, an exuberant Mercy ends up behind the wheel! Soon there's a policeman on her tail, a struggle for the brake, and a blissfully airborne Mercy. Of course, it's nothing that an extra helping of buttered toast can't fix! KATE DICAMILLO is the author of the first story about Mercy Watson, MERCY WATSON TO THE RESCUE. She is also the author of THE TALE OF DESPEREAUX, which received the Newbery Medal; BECAUSE OF WINN-DIXIE, which received a Newbery Honor; THE TIGER RISING, which was named a National Book Award Finalist, and the new middle-grade novel THE MIRACULOUS JOURNEYOF EDWARD TULANE. She says, "A long time ago, my best friend's son, Luke Bailey, put a toy pig in a toy car and pushed the car around the living room, screaming, 'Look, look, pig taking a ride! Pig taking a ride!' During the next few hours, this phrase was repeated with such shocking volume and intensity that it took up permanent residence in my brain. MERCY WATSON GOES FOR A RIDE is the direct product of Luke's obsession and mine, a decade or so after the fact. Look, Luke, pig taking a ride!" CHRIS VAN DUSEN illustrated the first book in the Mercy Watson series, MERCY WATSON TO THE RESCUE. He is also the author-illustrator of DOWN TO THE SEA WITH MR. MAGEE, A CAMPING SPREE WITH MR MAGEE, and IF I BUILT A CAR. He says, "I have four brothers (no sisters! ), and cars were a big part of my upbringing. So when I read this story about a wild car ride, I couldn't wait to get started. I made the Watson convertible a 1959 because I love old cars with lots of chrome, fins, and style. It was also great to visit these characters again. We're becoming good friends!" With power-charged vocabulary, unexpected twists and turns, and glossy cartoon artwork, this rollicking tale is fuel-injected with humor. The rich vocabulary of the text, the retro look of the illustrations (including the pink 1959 Cadillac they drive), and the sheer fun of the tale will delight young children. 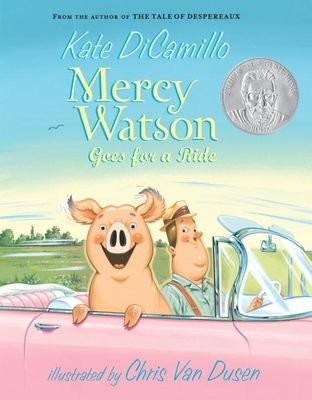 Fans of Mercy Watson will be happy to hear Kate DiCamillo has a new book in her series. The story is funny and the art is even funnier. DiCamillo underscores her incredible range with another Mercy Watson book, as silly and satisfying as the first. Certain to surprise and delight young readers. Van Dusen’s larger-than-life characters and retro sensibility extend the dry humor of the situation, and his shiny, rainbow-bright gouache art shoots the energy, especially Mercy’s, right off the page. Great for emergent readers. The second installment in the 'Mercy Watson' series, this choice is certain to produce lots of smiles and laughter. A fresh, fun-filled must-have for those looking to spiff up beginning-chapter-book collections. A spirited outing. . . . Chris Van Dusen’s spirited illustrations add to the unbridled fun.